With our minds on Halloween ghouls, comes a prequel about Dracula, the vampire invented by the Irish writer Bram Stoker back in 1897. An old Count who drank the blood of his victims; killing some, and converting others into vampires, it’s inspired a whole genre in recent times. But what if the original story was true? Dacre Stoker, the Canadian co-author of the newly released Dracul, believes that his great-granduncle based his horror novel on a factual story. Bram’s notes, journals and original manuscripts support this theory, he claims. Through extensive research, Dacre has discovered the original preface, which stated that the story was true – told to him by friends – and there were clues in the original first 121 pages which were excised before publication. The early chapters were cut, he discovered, because they were simply too terrifying to a public who were already traumatised by the actions of Jack the Ripper. As a child in Toronto, Dacre showed little interest in his famous ancestor. “People joked, ‘You can’t be a Stoker because you can’t eat blood.’ I got sick of it!” He became interested when the book, In Search of Dracula brought the story into a popular culture, but it wasn’t until 2003, when he was approached by the writer and director Ian Holt, that he became actively involved. This isn’t surprising. Dacre had done a lot of diverse things in life, from teaching to coaching the modern pentathlon to Olympic athletes, but he had zero writing experience. 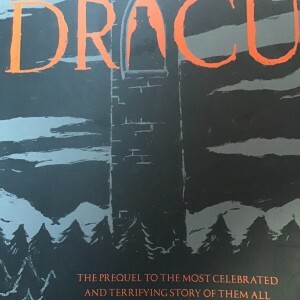 The resulting sequel, Dracula – the Undead, was criticised for ignoring Bram Stoker’s style, and putting Bram into the book as a character, but Dacre’s appetite for all things Dracula had been whetted. That ‘someone’ proved to be JD Barker from Pennsylvania, who is also here, publicising the book. The younger man has been obsessed with Dracula for most of his life. He’s even written a short story based on Dracula. No wonder that, having spent twenty years as a book doctor and ghost-writer J.D. penned a horror novel of his own. When Forsaken came out in 2014, and was endorsed by Stephen King, it sold 250,000 copies even though he had self-published. It got nominated for the Bram Stoker Award, and when Dacre read it, he decided J.D was the writer he needed. They met at the Horror Writer’s Association convention, sitting side by side at an author signing. Then Dacre invited J.D. and his wife to his cabin in the Carolina mountains, where, the second night, he presented J.D. with all the research material relating to Bram. These included copies of all the books Bram had referenced in the writing of Dracula – all pieces of the puzzle. Reading all this excited J.D, and he happily agreed to collaborate. It was a match made in heaven. Dacre is a walking encyclopedia on the Stoker family, and J.D. has a form of Asperger’s with the benefit that he can plot an entire book in his head. The resulting novel, Dracul – a prequel to Dracula – is utterly compelling, not to mention terrifying; with murders, body snatchers, empty graves, and a vampire nanny it truly is the best possible reading material for October 31st. Using real names, it focuses on Bram and his family, and includes adders, cockroaches, wolves, and plenty of the undead – those converted into vampires by the scheming Dracul and his cohorts. Many of the events mentioned feel authentic enough to be real – with the authors drawing closely on the Stoker family history. The discovery that Dracula’s Guest, a short story of Bram’s that his wife, Florence, published after his death, holds a key. Whilst Dacre is back to the day job – coaching the world number one ranked Real Tennis player, whilst teaching CPR, his co-writer is working on other books. Writing the third of a very bloody crime series – he’s just started collaborating with James Patterson. The two hope to collaborate again. And there is enough material left over in the archives which they didn’t use in Dracul. Would Bram Stoker approve? J.D. certainly thinks he would. So, he was directing them? Saying he’s keeping an open mind, Dacre quotes from Dracula. Published in The Irish Examiner on 27th October.